Where do I even begin with this adorable, sweet, hilarious, nerdy and rad couple?! Okay I know where I can start - Disneyland! I got hired to work at Disneyland as friends with Merida from Brave in April of 2012. Brave was going to be released in a couple months, so we got trained for the location in the park to meet Merida and her brothers. Amber and Art were part of our opening team for this location and I was quick to fall in love with Amber’s sassy-ness (especially when it came to when she got to babysit Merida’s brothers) and I adored the two of them and am always so thankful for that Brave family. When Amber contacted me to work on her wedding this year, I was SO excited. She told me she wanted to incorporate a color palette of rose gold, blush, champagne, garden greenery and khaki and I think we nailed that! We used the rose gold for the foiled custom monogram and calligraphy names + venue in the invitations as well as in her sparkly envelope liner. 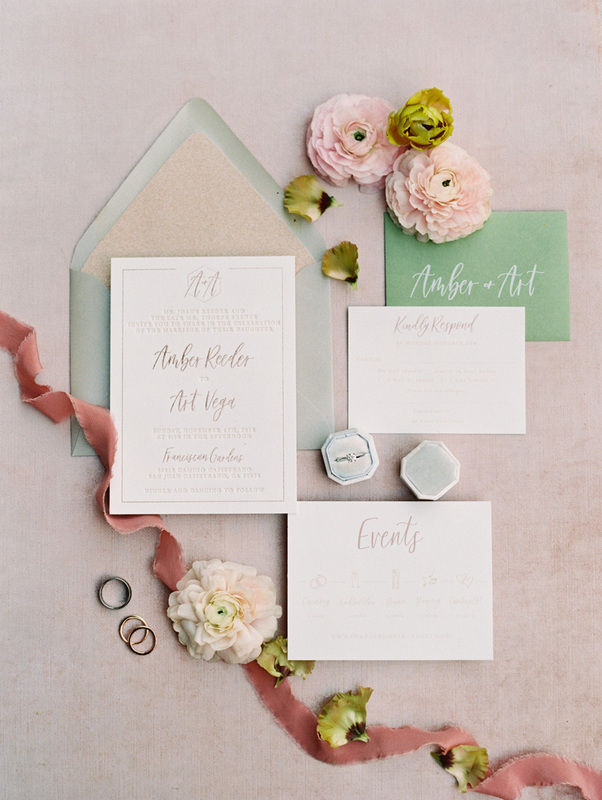 The outer envelopes were eggshell with garden green addressing and each guest opened that to see a shimmery sand colored inner envelope with rose gold calligraphy of their first names. We used the garden green for the reply envelopes which was the perfect pop of color. The khaki color was used in the letterpressed text for the invitations and other cards. We assembled each invite with a blush belly band to tie it all together and it was absolute perfection for their Franciscan Garden wedding! Now a fun fact about Amber and Art - they are adorably nerdy and love fandoms! Amber’s favorite fandom is Harry Potter and Art’s is Star Wars, so we used icons from each of those in their cocktail napkins! Seriously - so effing cute!! Amber also had a great idea to use their favorite fandoms in their seating chart and table names! They gave me their 14 favorite fandoms and I created a seating chart using icons to represent them. They also had laser cut icons cut out and used as the table identifiers! SO creative! Here are all of the fandoms below so you can see if you notice them in their details! We used quotes from some of these in their menu as well - see if you can get all of the references! Their place settings also included a place card, menu and a little favor on top of the special custom M&Ms too! I absolutely loved everything about this wedding from the very first meeting all the way to the day of. I was so excited when Mallory Dawn Photography asked me to assist her the day of because 1. I love helping her, and 2. I never get to see the weddings come together in person! So it was so much fun being there with their families (by the way - Amber has the most hilarious mom and grandmother and I just LOVE them!) and also helping their families during the process too. It made it extra special for me and I’m just so excited for these two to spend the rest of their lives together. Amber and Art, thank you for trusting me with your paper goods and for letting me be a small part of your big day! Love you both and congratulations! !